A top floor 2 bedroom & 2 bathroom apartment on the Salinas de Vera urbanization in Vera Playa with a private terrace enjoying lovely views of the communal pool and gardens, access to indoor & outdoor communal pools, beautifully maintained communal gardens and allocated parking. The apartment comprises a fully fitted kitchen with all white goods, an enclosed utility area off the kitchen, a lounge/diner, 2 double bedrooms, family bathroom and en-suite bathroom to the master bedroom. A private terrace can be accessed via the lounge which offers lovely views of the communal areas. The property can be sold as seen. A bar and restaurant are located just a short 2 minute walk away from this urbanization, whilst a large supermarket and Vera Aquapark are just a 15 minute walk away. The development is also connected to the local bus route, with buses running to Vera, Garrucha and Mojacar. The Vera Playa area boasts unspoilt Blue Flag beaches and benefits from over 320 days of sunshine each year. There are two main supermarkets plus an abundance of bars, beach bars & restaurants in the area, some a few minutes walk from the property, and others a few minutes drive away. Close by is the small fishing town of Garrucha, which is particularly renowned for it’s speciality seafood restaurants. 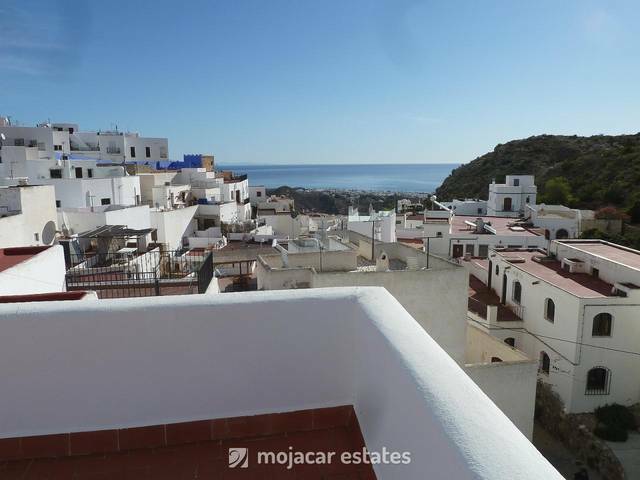 From Garrucha you are just a short drive to drive to the beaches of Mojacar with a wider choice of bars & restaurants and the historic 'pueblo blanco' – the white hilltop village of Mojacar. The main town of Vera is the primary commercial point in the area, and all day to day amenities can be found here, including all manner of shops, a 24 hour medical centre, a pharmacy, an Iceland supermarket for British products as well as some very interesting historical buildings, architecture and the Vera Bull Ring. The area is also a great base for golfers with 4 courses within a 15 minute radius, catering for all abilities between them. There is also a water park for the children (big and small! ), a sailing club at Vera beach and a Go-Kart track just on the outskirts of Garrucha. There really is something for everyone here. Peace and quiet, activities, fantastic variety of cuisine, beaches, pools, and the all most important ingredient of all...sun! Local airports all served by various UK budget airlines; Almeria airport - 40 mins drive; Murcia San Javier airport- just over 90 mins drive; Alicante airport – 1h 45 mins drive.